“Since 2012, a billion-dollar, multi-year programme has been in place to rip out and replace key assets – while keeping trains running for 20 hours a day and coping with increased ridership. This excerpt is from “SMRT: Progress on Track”, SMRT’s rail renewal story that was in The Straits Times on 3 Wednesday, 2016. 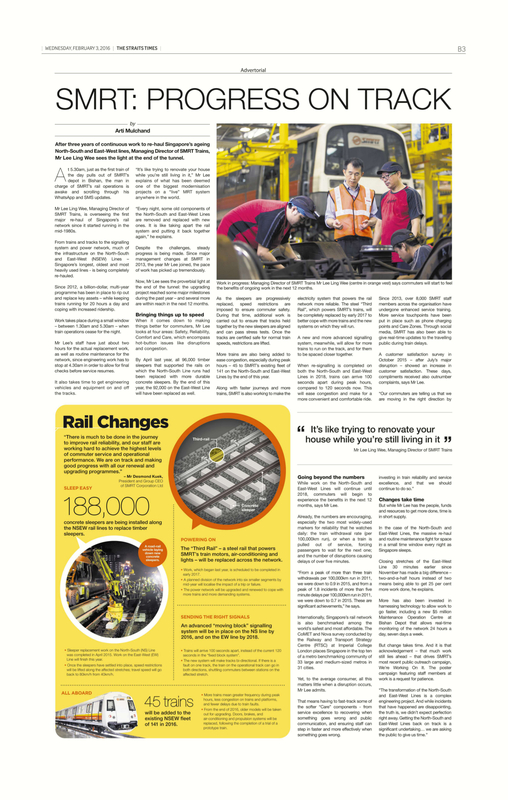 From re-sleepering to re-signalling, the article covers the many different projects in the overall rail transformation journey and gives commuters a sense of when they will start to feel the benefits of the ongoing work. The article also includes an easy to read sidebar that summarises all four renewal projects. Click on the image below to view it. 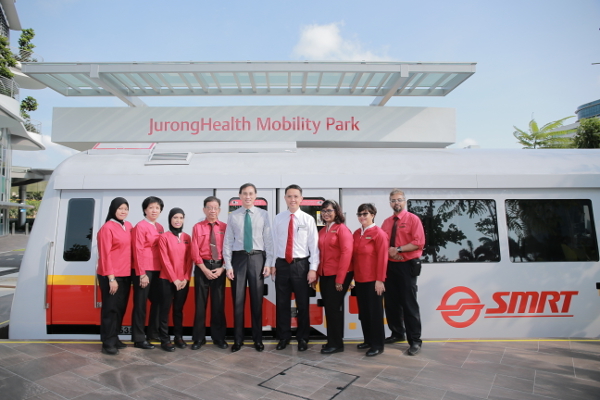 When JurongHealth approached SMRT in 2013 with their idea to create a first of its kind mobility park that included public transportation features, we immediately said yes. It sits well with our vision of “Moving People, Enhancing Lives”. SMRT’s experience transporting millions daily by rail and road transport can greatly contribute to such a park that brings rehabilitative care for patients to a whole new level. 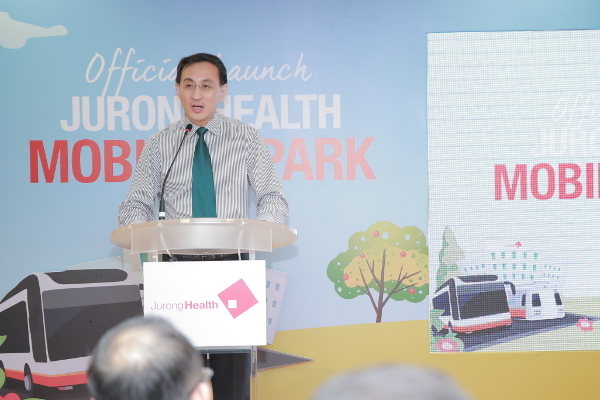 We are proud of this partnership with JurongHealth over the past three years. We contributed a life-sized train, bus and taxi to replicate real-life conditions so that people with mobility needs can regain their confidence in taking public transport. Many of us take this daily routine for granted. But for those who have suffered some disability or illness, this seemingly simple activity can be both physically and emotionally challenging. Training and sharing sessions will be organised so that staff can assist patients and commuters to make the necessary adjustments and feel more comfortable when using our trains, buses and taxis. 1. Welcome to SMRT’s first Customer Experience Innovation Conference – CXI. We are pleased that you can all join us, and I would like to welcome our guests, strategic partners and distinguished panel of speakers, for taking time to be with us this afternoon. 2. Today’s CXI conference is one of many initiatives that we embarked on as part of a Service Excellence campaign that was started back in 2013. It is important for us to understand why we did so, and why we continue to place significant management emphasis on driving and sustaining the organization-wide effort to bring about a high quality in customer experience. 3. The period of 2010-2013 was a particularly rough patch in SMRT’s 29 year history. Although it may seem to some like just the other day, it has been 4-5 years since. If you recall, a series of troubling incidents during these recent times – from vandalism, to major train disruptions and nagging reliability issues, to an illegal bus strike – Singapore’s first strike in 26 years – had severely hurt our reputation, and shaken public confidence. Meanwhile, ridership continued to grow and operational demands intensified despite an aging network urgently in need of renewal and upgrade. Investor sentiments were undermined as profits plunged, and internally, staff morale was at a low with high staff turnover in many quarters. 4. Against such a formidable backdrop of challenges, where and how do we start to get people on board, our programmes on track, and the company on top again? We needed to regain the trust and confidence of all our stakeholders. And there are many: our staff who commit to achieving our company’s mission and goals; our commuters whom we carry on their journey safely each and every day (all 1 billion passenger journeys last year); the authorities who entrust us with the delivery of a high quality of public transport services; and our shareholders who invest with us in anticipation of steady annual dividends. 5. Not all these interests are aligned, as you can expect. But all, whether external or internal, are customers in one form or another whose experience with us is important. We decided therefore to place our leadership focus squarely on people – and set out on a Service Excellence campaign to deliver the kind of customer experience that we would all be proud of. We made Service Excellence one of 6 core values – the S in SMRTnI. We set Customer Experience as one of the 5 key strategic thrusts that would guide the prioritization of management effort across the company. It formed part of a set of key performance measures that would be factored in our collective management performance incentives. More than just a desired outcome, we turned this into a platform to shape work culture and engage the hearts and minds of all 9000 of our staff. 6. Changing culture takes time and consistency of leadership effort. It needs to involve every single individual in the organisation. Often results are seen only in the long run, and one can easily be distracted by immediate issues and expediencies. We knew it was a journey that might never finish but that did not deter us from making a bold start. With collective buy-in from rank and file, we embarked on Service Excellence with a passion – to unite everyone with a common mindset and purpose – to build trust and bring on smiles every day, and with everyone who journeys with us. 7. This was the critical catalyst for an organization-wide change effort to align all staff in operations, maintenance, administration, commercial business, quality assurance, and front-counter activities – toward excellence in their service wherever they were in the company. We wanted to foster a climate where people can feel empowered to initiate and innovate in their Service Excellence efforts towards positive customer experience. .
8. In these past 3 years, I’m proud to say that we have made significant progress. 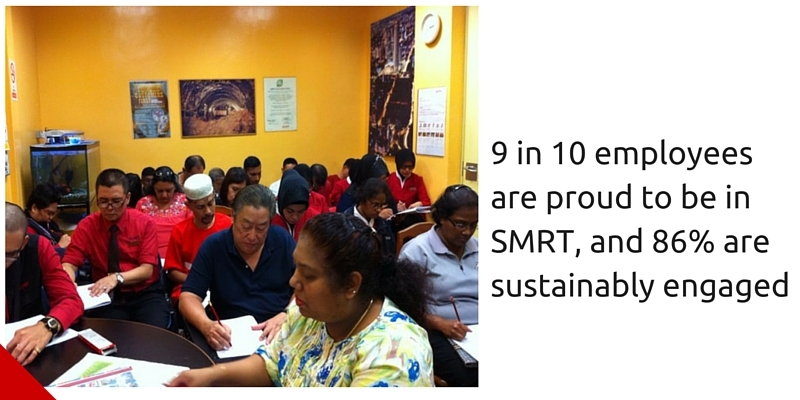 Our Organizational Climate survey conducted by Towers Watson last year showed that 9 in 10 employees are proud to be in SMRT, and 86% are sustainably engaged – a measure of how engaged, enabled and energised they feel about themselves in the company. On a global scale, that puts SMRT as Best in Class, especially for companies undergoing transformation and transition. In business output, the bus business turned around to make a small operating profit after many consecutive quarters of losses. And based on the international metric for train reliability based on delays lasting more than 5 minutes for every 100,000 km, we have that number down from 1.8 in 2011 to 0.71 in Dec 2015, the best performance in the past decade despite the ageing network. .
9. But it’s the ground-up stories of people who have gone the extra mile that move and inspire us. 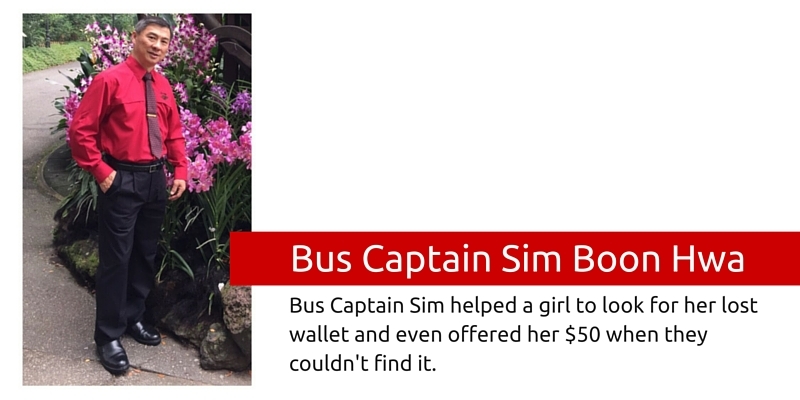 One example is Chief Bus Captain, Sim Boon Hwa, who in December last year was approached by a school-girl who thought she had lost her wallet onboard the bus service 188. He was supposed to start his duty in a few minutes, but seeing how sad and anxious the girl was, he did a quick search on the service 188 buses that were parked at the interchange. Unable to find the wallet, he asked her to follow him on his bus service 855 to make a police report at Queenstown Police Station along the route. Before she alighted, he gave her $50 in case she needed money to pay for her trip home. The next day, the girl called to inform that she had found the wallet in her friend’s car, and to arrange to return the $50. But Mr Sim declined and told her that the $50 would be his Christmas present to her. 10. Another example is our Assistant Station Manager, Nurulhuda. The passenger lift at City Hall MRT Station was undergoing maintenance until 8 am that morning. Knowing that her regular passenger who is wheelchair-bound would face difficulties when she exits the station, she took the initiative to call her and advised her to delay her journey to avoid the inconvenience. While the gesture may have been simple, having that attention to detail and personal touch with each and every commuter is truly Service Excellence at its best. 11. 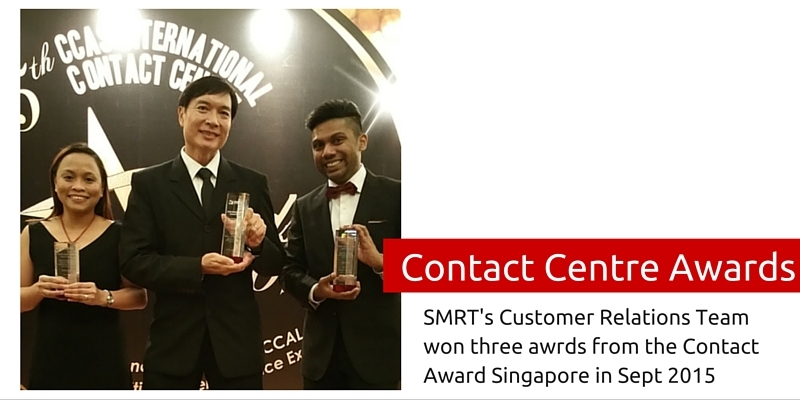 With many other deeds like these, SMRT has won numerous national-level Service Excellence awards over the past few years – including the prestigious Singapore Service Excellence Medallion, the Singapore Experience Awards for Customer Service under the Transport industry and Contact Centre Association of Singapore annual awards. 12. We are determined to continue to serve and excel, innovating in improving the experience of all our customers. This afternoon, we look forward to learning and sharing with experts and leaders in Customer Experience and Innovation. Innovation is as much an idea or act, as it is a state of mind. We can apply this in end-to-end service delivery in a commuter’s journey, from before he or she even steps into the network, with way-finding, passenger information services and physical signages, to consumer amenities in the retail shops and advertising spaces as he makes his way through the transit network, to every single commuter touch-point that make for a more enjoyable journey. I wish all of you a meaningful afternoon of reflection and inspiration as we find new ways to innovate the customer experience.